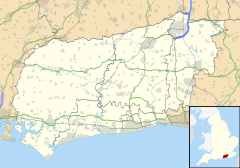 Rudgwick is a village and civil parish in the Horsham District of West Sussex, England. The village is 6 miles (10 km) west from Horsham on the north side of the A281 road. The parish's northern boundary forms part of the county boundary between Surrey and West Sussex. The parish covers 6,394 acres (2,588 ha). The 2001 Census recorded 2,791 people living in 1,013 households, of whom 1,425 were economically active.. The 2011 Census recorded a population, including Tisman's Common of 2,722. Historically Ridgewick was an alternative form of the toponym. Riccherwyk may be another, seen in 1377. The Church of England parish church of the Holy Trinity has a 12th-century Norman font of Sussex Marble. The belltower is early 13th century. The church was largely rebuilt in the 14th century, when the north aisle was added and probably the present chancel was built. The parish has two 17th century farmhouses. Garlands, 1.5 miles (2.4 km) south of the village, is early 17th century and Redhouse Farm 1 mile (1.6 km) north of the village is late 17th century. Naldrett House, 1 mile (1.6 km) south of the village, is an 18th-century Georgian farmhouse of three bays and two storeys, built of brick with stone quoins. Rudgwick had a Dissenters' chapel by 1848. Rudgwick railway station on the Cranleigh Line was opened in 1865 and closed in 1965, as part of the Beeching cuts. Pennthorpe School is on in Church Street. Rudgwick Primary School is located in the community. The Rikkyo School in England, a Japanese boarding school, is also located in Rudgwick. ^ a b Lewis 1848, pp. 707–711. ^ a b c Nairn & Pevsner 1965, p. 315. ^ a b Nairn & Pevsner 1965, p. 314. Cite error: Invalid <ref> tag; name "FOOTNOTENairnPevsner1965314" defined multiple times with different content (see the help page). ^ "Contact Us." (Archive) Rudgwick Primary School. Retrieved on 8 January 2014. "Address Rudgwick Primary School Tates Way Rudgwick West Sussex RH12 3HW"
^ "INFORMATION IN ENGLISH." (Archive) Rikkyo School in England. Retrieved on 8 January 2014. "Guildford Road,Rudgwick,W-Sussex RH12 3BE ENGLAND"
Lewis, Samuel, ed. (1931) . A Topographical Dictionary of England (Seventh ed.). London: Samuel Lewis. pp. 707–711. Nairn, Ian; Pevsner, Nikolaus (1965). Sussex. The Buildings of England. Harmondsworth: Penguin Books. pp. 314–315. ISBN 0-14-071028-0. Wikimedia Commons has media related to Rudgwick.